Eat How Many of Your Coworkers are *Actually* Hungover? 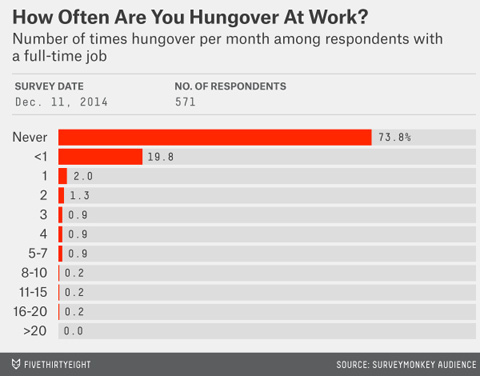 How Many of Your Coworkers are *Actually* Hungover? According to one survey by FiveThirtyEight.com, 74% of full-time employees said they never go into work hungover. Well that's hard to believe. Nate Silver’s FiveThirtyEight blog has thrown the full weight of its statistical analysis behind the following question: How many of your coworkers are hungover right now? Check out the full breakdown, detailed in the chart below. According to this survey, it seems the majority of workers in America are arriving to work bright eyed and bushy tailed. That being said, 6% of people are coming into work hungover at least one time per month (Hickey refers to these people as “champs”). It’s kind of funny to think that, at this moment, roughly 2 million Americans are hungover at their desks right now. At the very least, next time you come into work with a pounding headache and a fatty bacon, egg, and cheese in your hand, you can take solace in this statistic.